As the first and last of the Spanish colonies in the Caribbean, Cuba has a Spanish influence that you can taste. 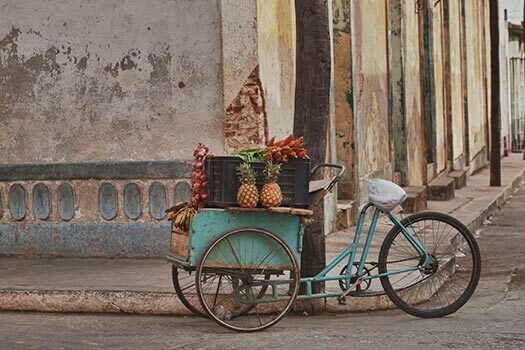 Once a major trading port, Havana welcomed boatloads of immigrants from the European country and, along with them, their distinct culinary flavors. Despite, or perhaps because of, the U.S. embargoes that began in 1961, Cuba has both retained and adapted many of its food preferences. Cut off from its primary source of imports, and isolated as an island country, Cuba was forced to cultivate a new means of importation. Strengthened by their ties to the Soviet Union, the island began to introduce new food products into the diet. For example, chicken and fish rose in popularity to rival the preferred meat of choice, pork. Beef all but disappeared from the culinary landscape. However, as a result of the restrictions, you will also find American influences missing in Cuba -- a rarity in our Western-touched culture. In today’s Cuban dishes you’ll find a number of roots and tubers such as boniatos and yucca. You’ll also see plantains and bananas in many recipes along with the ever-present rice. Some of the more popular dining options include moros y cristianos (black beans and rice), lechon asado (slow-roasted pork) and sopa de camarones (shrimp soup). And the cubana, or a Cuban sandwich made of roasted pork, is a mid-day staple on the island. In the past, restaurants were prohibited from serving more than a small seating of guests, essentially putting the kibosh on a vibrant restaurant scene. Today, new fine dining establishments are popping up all over Havana. However, even with the emergence of some pretty fantastic food destinations, the mom and pop corner restaurants and street vendors still provide some of the most flavorful experiences around. For your own taste of Cuba, YMT Vacations is offering a people-to-people educational program to the island. For information, call your travel consultant or 1-800-922-9000.